Kid's Co-op: 10 NEW Takes on Summer Classics! From bubbles to playgrounds to sidewalk chalk, there were lots of new takes on classic summer activities in last week's Kid's Co-op! 1. What's more classic than sidewalk chalk? Creative Family Fun shared a driveway shape maze. 2. I think these toddler friendly s'mores from Raise a Boy are genius! 3. There's lots of fun at Lasso the Moon with 5 ways to take sidewalk chalk to the next level. 4. Bubbles are a true classic in the summer. Adventures in Reading with Kids turned bubble blowing into art! 5. How fun is this playground scavenger hunt at KC Edventures?? 6. Little Wonders' Days combined science and fun with an experiment in bouncing bubbles. 7. Love, Play, Learn came up with a fun game involving water balloons. 8. Famiglia and Seoul tells a sweet story about some learning fun on a nature walk. 9. My kids love the sandbox. They'd love it even more if it was Familylicious' sand table full of pirate treasure . 10. 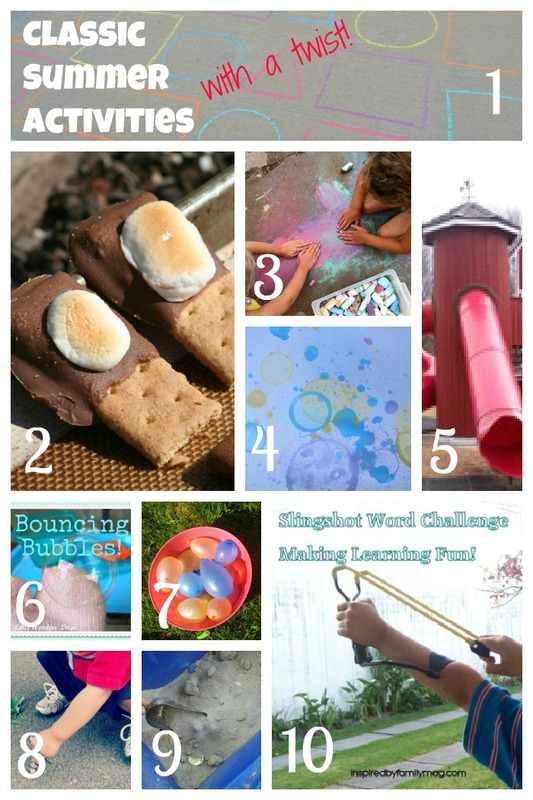 Inspired by Family Magazine snuck in some learning with an activity I know my son would love with a slingshot word challenge. Thank you for featuring the bubble art! We loved the ice boats you made this week! Thank you so much for featuring the water balloon game! Thanks for featuring our driveway shape maze! !